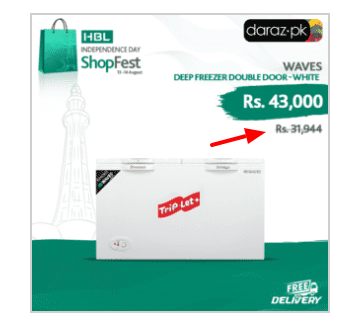 Just in case if you still don’t know, HBL-Daraz are celebrating this Independence Day through a Mega Shopping Festival. The sale event has kicked in and deals are now being unlocked. Then there are flash deals available as well and they are being opened to public after every three hours till 9PM on August 14th. The Azadi celebrations are offering discounts up to 70%, to celebrate 70 years of independence. Additional discounts can be availed if you pay through HBL credit or debit cards. While the deals are being unlocked, we did the hard-work for you to pick the best discount deals that are available at the shopping festival. You can simply explore below banners to get to know about the deals that are being offered at HBL-Daraz Independence Day Shopping Festival. Fake deal. There is no HP Elite book available for 21k. We should encourage such deals. ek me mistake huwi to kia huwa. My dear fellows, again i would request please check prices from market before ordering anything over Daraz.pk, its a biggest online fraud. This promotion is such a fake! I recorded the prices of some of their products that were alot lower before the so called promotion and somehow they magically risen one night before and then this blissful promotion brought it back to its original price, giving a false sense of faked discount. Shame on Daraz.pk strategists out there who are running the portal same way the govt. is being run. First create a fake shortage of electricity and when there’s enough uproar on the streets, do a jalsa and resume the supply, doing ehsaan on the public. Ye sab mil k humko pagal bana rahy hen….